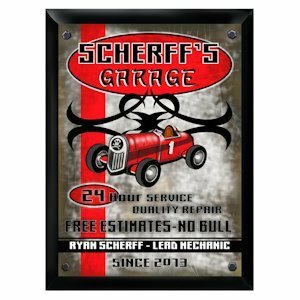 Perfect for the car-lover or the guy that likes to tinker around with stuff in his garage, this sign features a vintage race car along with information about his garage. Personalize it with his name and the year his garage was established. Other important messages on the sign include: 24 hour service, Free Estimates and No Bull. Great graphics make this one-of-a-kind sign a classic.